Today, British Airways released a few updates to their frequent flyer program. The last time they changed their program was over three years ago, back in 2011. With most frequent flyer programs devaluing every few years, I should have known BA was pretty ripe for some changes. British Airways is modifying their scheme for earnings on paid fares, where the earnings rate for deep discount economy fares are slashed significantly from 100 to 25%, while premium fare classes increase roughly 25-50%. Furthermore, the changes implement a two-tier (peak and off-peak chart for British Airways). However, redemptions on British Airways metal incur absurd fuel surcharges that I refuse to pay. So for 95% of readers here, the only information most of us care only to redeem our points that we earn from credit cards and points transfers on partner airlines. This will still be at a 1:1 ratio, for programs such as Membership Rewards which are earned by cards like the American Express Gold Card (review here) and the Platinum Card (review here). This means the changes in regards to earnings on paid fares effectively are irrelevant. For a general rule of thumb, that means I incredibly dislike the majority of the time when airlines (and hotels) modify their redemption rates, because in most cases this means an increase in the number of points required for an award, with no compensating increase on the earning side. This phenomenon stems from inflation and that there isn’t a capped on the number of miles issued, but I digress. Comparing the new and old charts side by side are a little dizzying, so I’ve made two tables detailing the difference in miles. As you can see, these changes are no exception, and there are no positive and many negative aspects. What Awards Change in Price? The only thing I’m thankful about is that the 80% of my typical redemptions will not be affected. Short-haul economy class redemptions remain the same cost in miles, a significant proportions of my redemptions. Furthermore, business class redemptions under 2,000 miles also stay the same. All oneworld short-haul service to Canada and in most parts of the world, with the exception of US domestic service, is two-cabin economy and business class, meaning what Avios has traditionally been known to be very useful for – short-haul direct flights, do not change. A 45,000 points signup bonus after spending for the American Express Business Gold Card (details here) will still get you 6 one-way economy class tickets from Toronto to New York, and 3 one-way business class tickets from Vancouver to Los Angeles. It still is one of the best uses of the signup bonus and is a great value. Redemptions like Vancouver to Los Angeles/Phoenix/Seattle, Toronto to New York/Philadelphia/Washington DC, London to Paris/Frankfurt/Amsterdam/etc, Sydney to Melbourne/Brisbane/Auckland, Hong Kong to Taipei/Bangkok/Seoul remain at the same level. I call these changes a devaluation because it destroys the value of most mid/long-haul routes that may have been a good value, especially since British Airways does levy fuel surcharges on long-haul partner awards. First Class awards will now be 4x the price of economy which is a very high ratio. 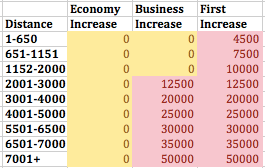 Business Class awards in Zone 4 (2001+ miles) and above will now be 3x the price of economy. Any award above 2001 miles in a premium class will require more miles after the devaluation takes place. This is luckily less of what I redeem for, but still hits many valuable redemptions. For example, the cheapest way across the Atlantic on Aer Lingus from Boston to Dublin, will now be 37,500 miles, an increase over the previous level of 25,000 miles. The cheapest way to fly Cathay Pacific First Class in Asia from Hong Kong to Taipei goes from 13,500 miles to 18,000. Their fifth freedom route in North America from New York to Vancouver increases both 12,500 miles in business and first class. These rates are still competitive, but much less so than before, especially when you’re looking at 5-7 hour flights. 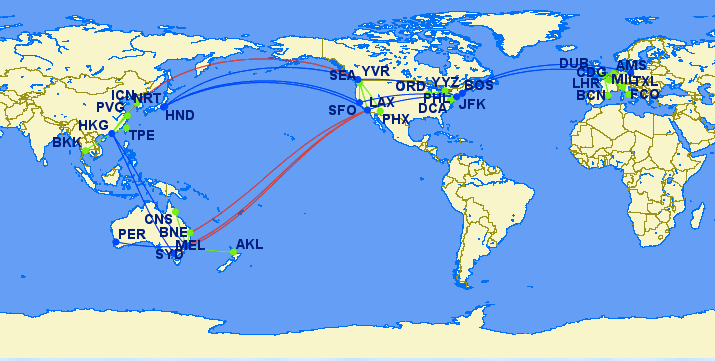 The longer the flights are, the less competitive the award chart becomes with other programs. For example, Air Berlin Business Class from Dusseldorf to New York will go from 40,000 to 60,000 miles, an increase of 20,000. JAL Business class from San Francisco/Vancouver to Tokyo will go from 50,000 to 75,000 miles. Cathay Pacific First Class for Los Angeles – Hong Kong goes now from 105,000 miles to 140,000 miles each way. In my opinion, this is the worst part of the devaluation. I’ve also drawn up a map highlighting the changes. All green routes are unaffected, while blue and red routes are. I think it gives a good overview of what the British Airways changes are doing. These changes will be in effect April 28, 2015. Lock in the old rates before then! Changes/cancellations would be up to $55, and any modifications to current ticketed awards would likely incur the new amount of miles, but even for speculative bookings (especially for those where you only forfeit under $55 in taxes for cancelling) ticketing now is not a bad idea at all. For all changes, see the British Airways Executive Club website and their FAQ page on the changes. Just to confirm, an Economy Air Lingus from Boston to Dublin is still 12.5k one way right? I prefer to use BA in Y and PY, do you know if the PY rate will change? The worst aspect is that OW partner awards will all be at peak rates from then on – that’s a big hit! There are winners and losers, but I’m with you – almost all of my redemptions will be unaffected (short-haul economy flights). And given the climate of devaluation that we live in, staying the same is a net positive for me. I guess saving for first class on a BA A380 will take longer!! Great explanation of the changes! I recently booked premium economy on CX from YVR to JFK for 18,750 in mid December. Is this going up as well? Unfortunately, yes. It’ll be 25k in May.